When you walk the streets of downtown Dunedin, you see a multitude of bike shops, bustling inns, busy cafes and humming businesses. The downtown area is also filled with joggers, bikers, roller-bladers and leisurely walkers, all perusing local businesses and enjoying coastal scenery. Much of the excitement and vitality in Dunedin comes from the Pinellas Trail, which runs through town on an abandoned CSX railroad corridor. 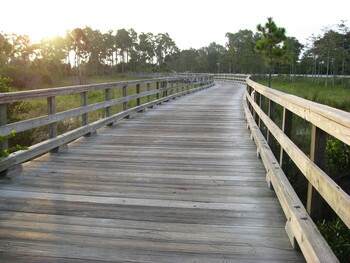 The multi-use trail stretches from St. Petersburg to Tarpon Springs. The trail offers the community a safe and convenient means of getting to work, schools, parks and shopping. The trail is both an attraction for tourists and an economic asset for the community. Thanks to the Pinellas Trail, downtown Dunedin’s business occupancy rate rose from 30 percent to 100 percent. There is now a waiting list for available retail space. The Office of Greenways and Trails is developing a Florida Trail Town program in cooperation with community partners from around the state. One of the main goals of the Trail Town program will be to promote community involvement and citizen pride in community resources. Old favorites and new offerings will be part of Paddle Florida’s 2017/18 paddling season. A 65-mile journey from Madison Blue Spring to Branford on the Suwannee River Wilderness Trail kicks off the season in October. A first ever Flagler Coastal Wildlife Experience will take place in early November. The Ocklawaha Odyssey, 48 miles down the spring-fed Silver and Ocklawaha Rivers, is featured in December. The group will return to the popular Withlacoochee River South in January with its springs, sloughs and lakes, ending at the Gulf of Mexico. Coastal waters and islands are featured on February’s Great Calusa Blueway trip and for the first time, 86 miles of the Choctawhatchee River in the Panhandle will be paddled in March. The season finale will be the Suwannee River Paddling Festival in April. In other paddling news, paddle the remote waters around Steinhatchee as part of the Hidden Coast Paddling Festival Oct. 11-15, and don't miss the Florida Paddlers Rendezvous at Silver Springs Oct. 27-29. A group of paddlers with a wide range of experience levels took part in the American Canoe Association (ACA) Coastal Day Trip Leader course at Lake Louisa State Park on May 9-12. The training involved 16 hours of intense instruction with expert ACA instructors Russell Farrow of Sweetwater Kayaks, Wayne Douchkoff and Kim Munshower. The course focused on risk assessment and group management, an excellent fit for creating future generations of safe paddlers. The training was part of the Florida Paddlesports Program coordinated by OGT, which trains volunteer guides to lead groups of kayakers in a safe and fun manner, especially families with children. So far, 65 people have completed the course and several of these trained volunteers are leading trips for the public in Florida State Parks. The next training will take place Oct. 10-13, 2017 at Lake Louisa State Park. For more information, contact doug.alderson@dep.state.fl.us. --Unpaved Non-Motorized Trail Guidelines are now on the OGT website. Compiled by OGT staff and a subcommittee of the Florida Greenways and Trails Council, the guidelines cover accessibility, pre-construction considerations, trail construction, wayfinding and trail amenities. Hiking, cycling, equestrian, multi-use and paddling trails are all included. 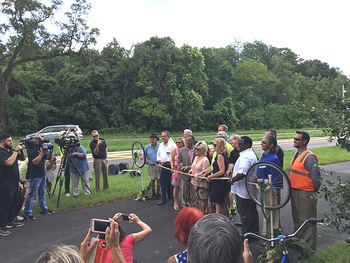 --The city of Edgewater held a July ribbon-cutting to celebrate the first SunTrail project that will break ground on the 250-mile St. Johns River-to-Sea Loop (SJR2C). Sun Trail stands for Shared-Use Nonmotorized Trail Network and is funded through the Florida Department of Transportation at $25 million per year. On Aug. 10 in St. Augustine, 87 attendees participated in the first major stakeholder meeting for the SJR2C. The SJR2C Alliance is planning a major summit for the trail on Oct. 26-28 in Deland. The Office of Greenways and Trails (OGT) is updating its five year plan along with the statewide opportunity and priority trail maps. Many trails are eligible for certain types of funding if they are on one or both maps. OGT staff have been meeting with local planners and trail groups around the state and, as a result, several modifications are being considered. Two priority multi-use regional trails are being proposed for Polk, Highlands and Okeechobee counties for the first time. As part of the update, OGT will hold 14 workshops throughout the state - from Milton to Miami - to receive input from trail users, local planners and the public. The final draft of the plan and maps will be brought before the Florida Greenways and Trails Council in early December 2017. To find a September workshop near you, check out the full schedule. All workshops take place from 4 - 7 p.m. This has been a busy summer for trail advocates. 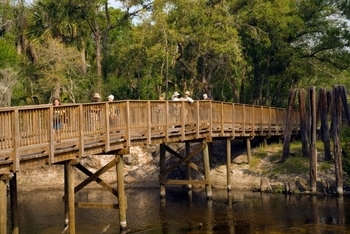 On July 20, the Pinellas Trail segment of the Florida Coast to Coast Trail (C2C) was officially opened. The Pasco County segment of this gap will go to construction in the summer of 2018. Once that is complete this section of the C2C will be more than 100 miles of continuous trail! Other trail segments are also moving forward rapidly with not only construction, but also important planning alignment studies. In other news, the Florida Greenways and Trails Foundation held its last meeting in Fort Myers where they engaged the local community with discussions of various bike and pedestrian activities and trail development. This is a community in the path of the Gulf Coast Trail that connects the Pinellas Trail to the Naples area. The Pinellas Trail is the western terminus of the C2C, therefore, when these regional trails are complete there will be a continuous connection from Naples to the Space Coast! It should be noted that the Florida Greenways and Trails Council will be taking action on an updated Florida Greenways and Trails System Plan and maps in December and the Foundation is making recommendations to ensure it is a fully complete system. Trails are an important element of our transportation system because they provide a safe environment for cyclists and pedestrians. This not only gets cars off the road, which is good for the environment, but it also provides for and supports a healthy lifestyle. The Foundation is committed to supporting the state trails efforts and do all we can to assist at the state, regional and local level. So, stay tuned for more developments! How Much Time Do Americans Spend Outdoors? The 2017 “Nature of Americans National Report” by DJ Case and Associates showed that more than half of all adults spend five hours or less outdoors each week, and most are satisfied with this amount of time. Children between the ages of eight and 12 spend three times more hours with computers and other electronic devices each week as they do playing outside. This same study pointed to tremendous opportunities for changing the mindset of outdoor recreation. Three-quarters of adults believe that contact with nature is very or extremely important for physical and emotional well-being, and most believe that contact with nature can improve a child’s mental and physical health. During the study, children stated that they would rather climb trees, camp and explore woods than play on grassy lawns, showing there is a disconnect between reality and desires. The study makes 22 recommendations that can improve opportunities for people to interact with nature and enjoy the outdoors. 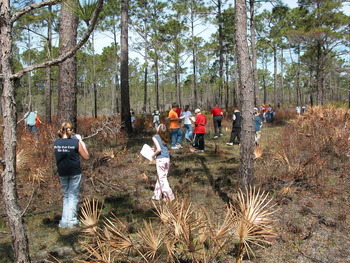 They include providing socially safe and satisfying places outdoors, especially for urban and minority adults and children; working to lower the perceived costs of participation in recreational activities; and building partnerships among professionals in healthcare, education, urban planning, conservation, community development, and other sectors. As part of an effort to promote the East Coast Greenway multi-use path along the entire east coast of the United States, the 2017 East Coast River Relay started in Calais, Maine on Aug. 24 and will finish on Oct. 30 in Key West. Participants will bike, walk, paddle, plant native plants and celebrate healthy watersheds. The relay's first Florida event is a salt marsh planting at Little Talbot Island State Park on Oct. 18. Other Florida events include community bike rides, river walks, issues forums, boat rides and a grand finale ride into Key West.